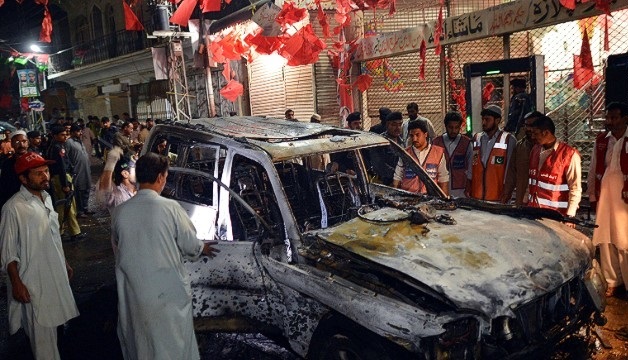 The spate of suicide bombings started in earnest within Pakistan in 2002, with two major suicide attacks perpetrated that year, which specifically targeted foreigners. Many civilians have, however, been collateral victims of suicide bombings, which were ostensibly aimed at higher value targets. 25 human bombs exploded themselves across Pakistan between 2002 and 2006. In succeeding attacks, many high ranking government officials were targeted, including General Musharraf and Prime Minister Shaukat Aziz. Pakistan witnessed a ten-fold increase in the incidents of suicide bombings in 2007 as compared to 2006. The year 2007 witnessed 56 suicide attacks alone, killing 472 law enforcement personnel and injuring 230 civilians; an average of a blast per week claimed more than 1,100 lives. There was a marked escalation of suicide activities in the aftermath of the Lal Masjid operation. Suicide bombing as a tactic was by now firmly established as a viable strategic terrorist tool. Before the operation, there had been 12 attacks in Pakistan between January 1 and July 3, 2007, killing 75 people. The remaining 44 suicide attacks took place after the Lai Masjid action, between July 4 and December 27, 2007, spreading to Karachi, Quetta, Peshawar, Lahore, Rawalpindi, Islamabad and other urban centres, killing 567 people, members of the military and Para-military forces and the police. One day after the start of Operation Silence, the first retaliatory suicide bombing took place on July 4, killing at least 11 people. The PPP (Pakistan people’s party) Chairperson Benazir Bhutto’s December 27, 2007 assassination in Rawalpindi was the most high-profile suicide attack of the year 2007. The previous attempt to kill Bhutto on October 18, 2007, was also perpetrated by a suicide bomber who blew himself up near a procession welcoming her home after eight years in self-exile. The suicide bomber could not target Bhutto, but killed over 140 people, mostly PPP supporters. This became the deadliest attack in the world at that time; before the October 18 attack, the deadliest suicide attack carried out anywhere in the world was the one that killed 133 people in the Iraqi capital of Baghdad on February 3, 2007, when a bomber had detonated an explosive-laden truck at a busy market place. In 2008, Pakistan hardly fared any better, topping the list of countries suffering from the menace of suicide bombings, leaving Afghanistan and Iraq behind during the first eight months of 2008. Pakistan suffered 28 suicide attacks during the first eight months of the year 2008, killing over 471 and wounding 713 others, including innocent civilians and armed forces personnel. Afghanistan and Iraq, despite facing a higher digit of suicide attacks during the same period, underwent lesser number of human losses. A total of 42 incidents in Iraq between January 1 and August 31, 2008, claimed 463 lives besides wounding 527 others. In contrast, 436 people were killed and 394 injured in 36 suicide attacks that took place in Afghanistan during the same period. There were 59 suicide incidents in 2008 in total. The two most prominent attacks were the August 22 attack on Pakistan’s main army munitions facility, Wah Ordnance Factory , killing 80 workers in the deadliest attack on a military installation in the country’s history, and the September 20 suicide attack on the Marriott Hotel in Islamabad. The Marriott blast was touted as Pakistan’s 9/11, killing as many as 80 people and injuring over 200. Subsequent investigations revealed that the Marriott attack was actually aimed at the Parliament house building. As regards the area wise breakup of the suicide attacks between 2002 and start of 2009, the Federally Administered Tribal Areas (FATA) and the KPK account for 60 per cent of all suicide attacks since 2002. Punjab’s 20 per cent includes the attacks on the Army’s main establishment, the General Headquarters, which falls within the province. The city of Rawalpindi is the seat of the GHQ, which alone accounts for nearly 10 percent of the total attacks. This is more than the share of Sindh, Baluchistan and Islamabad, respectively during the period. Examining the total suicide attacks that have taken place in different areas at any given point in time between 2002 and 2009,an interesting picture emerges: suicide attacks first started in Islamabad, Sindh and Baluchistan, the very areas that accounted for the least number of attacks at the time. Till 2006, Punjab and Sindh account for nearly 70% of the suicide attacks while there are none in KPK and FATA in the same temporal parameters. It is only in the first half of 2006 that attacks began in these areas. This corresponds with escalating unpopularity and widespread condemnation of these attacks in Punjab and Sindh, with large demonstrations against suicide terror perhaps indicating to the terrorist organizations that they were losing public support of these actions. The sharpest increase in FATA and KPK took place in July 2007, the month in which the military operation against the Lai Masjid in Islamabad was carried out. Around this time, there is also a dramatic increase in the attacks in the Punjab. After March 2008, however, attacks abated somewhat in FATA and Punjab, though they continued ceaselessly in KPK. At the same time, suicide attacks on religious targets – which till 2007 comprised the majority of the hits, nearly ceased altogether, indicating a marked shift towards military targets as the conflict in tribal areas intensified. Overwhelmingly, suicide attacks have targeted military and police personnel and buildings, with military installations being targeted after the military started operations in Bajaur Agency. Interestingly, no suicide attacks were perpetrated on military or police targets till 2006, even though the military operation against militants began in South Waziristan in July 2002. Within days extremists carried out a devastating suicide attack on a military base in Dargai, killing 42 soldiers to avenge the October strike. Thereafter, suicide attacks on military and police targets have become frequent, and there has also been a paradigm shift of pattern observed in 2009-14, which bears separate analysis.